I love my first box. You can tell there is a lot of time, effort, and love put into making the items and putting the box together. I used and liked everything, and that is rare for me to say! The affirmations are always simple and oh so good. I keep them in my car so I can read them everyday. I highly recommend this subscription. As I sit to write this, nothing comes to mind on how to improve the product for me. Everything I have to say is positive & beyond that. Your company & ideals are well natured, thoughtful, inspiring, powerful & beautiful. I do believe everything has the capability to grow, evolve, and improve. But with your company each product is designed so carefully and effortlessly, improving seems impossible especially when you’ve already mastered the art. I give so much love and respect to Merkaela! Keep on inspiring our souls. I was pleasantly surprised by what was in this box. Sometimes what you see advertised is not quite what you get but I am pleased with everything. The contents were nicely packaged with care, the bracelet I got is lovely, I love all the glass jars, and the soap smells fantastic. I got seven items - Earl Gray tea, Cypress body butter, Juniper Sage salt bath, Lavender meditation elixir, sweetgrass bar soap, the bracelet, and the sage-like burners. Awesome! Out of all the subscription boxes I've purchased this is the first one to really make me happy. The products are really high quality and I love the glass containers and all natural ingredients. The unusual scents like sage & tangerine put you in a blissful state and create a spa like feel. Plus they come out with new scents each quarter for you to try. The only negative is it's a quarterly box and having to wait 3 months for the new products is torture. This is how good the box is! Wonderful! The body butter is SOOOOO Nice! Can't wait to use the exfolient. I love the way this was packaged and the write ups for each item. I like how everything is tied together to help not just the body but the mind and the spirit as well. I am looking forward to my next box. I just received my first Merkaela box, and like everyone else has stated, it was well worth it. 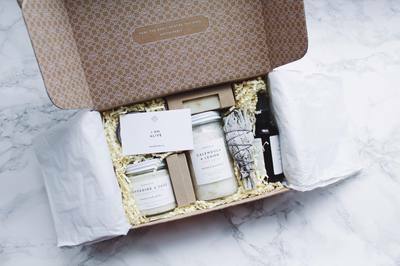 Everything was beautifully packaged, smelled great, and most importantly, contained natural ingredients! No strong perfumes or artificial colors to damage your skin! I’m very happy I decided to purchase this subscription. I absolutely love it! Thanks Merkaela for making a high quality natural box!! I absolutely loved everything in this box! I can’t say enough wonderful things about this box. I am going to contact the company to see about upgrading my annual subscription to the larger box. The scents are amazing. I found myself wanting to take my soap in my purse to work with me just because of the spa like feel and calmness it gave. I am going to be purchasing more. This is my favorite subscription box and I’m embarrassed to say I subscribe to 22. I know. I need help.